Apply for a permit; septic tanks, planning, asset protection, permit to burn and more. Information about what payment methods are available to you for Pyrenees Shire Council. Information about Council's community capital grants and community grants programs. Details about rubbish, recycling, green waste, hard waste and e-waste. Get in touch via email, on the phone, in person or send us a letter. Register your animal, report a lost animal or strays. Provide your feedback or get involved in your community. Kerrie White exhibition is a presentation of the physical and the personal. An Easter Sunday Breakfast and Games morning for families. Including Jumping Castle, and Kids Games and activities. 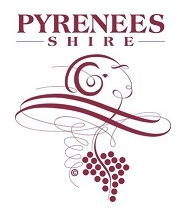 Pyrenees Shire has a history of significant bushfires. Are you prepared for this fire danger period?